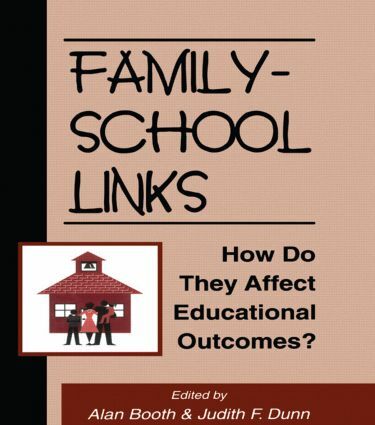 "The studies reported here identify some of the underlying factors affecting the family-school relationship, and suggest possible interventions for increasing the involvement of families." "…this volume provides a much-needed source of information for policymakers, researchers, and administrators." "The book is solid and comes highly recommended as a library acquisition or for courses dealing with school and family linkages. In the present climate of constructive analysis the editors' and authors' refreshing use of empirical data to make decisions regarding families and policy is worthy of note." Contents: Preface. Part I: Families and Schools: How Can They Work Together to Promote Children's School Success? J.S. Eccles, R.D. Harold, Family Involvement in Children's and Adolescents' Schooling. S.M. Dornbusch, K.L. Glasgow, The Structural Context of Family-School Relations. N.M. Haynes, M. Ben-Avie, Parents as Full Partners in Education. A. Lareau, Assessing Parent Involvement in Schooling: A Critical Analysis. Part II: How Do School Processes Affect Children and Their Families? K.L. Alexander, D.R. Entwisle, Schools and Children at Risk. T.D. Cook, Inequality in Educational Achievement: Families are the Source, But are Schools a Prophylactic? A. Gamoran, Effects of Schooling on Children and Families. C. Goldenberg, Schools, Children at Risk, and Successful Interventions. D.R. Entwisle, K.L. Alexander, Further Comments on Seasonal Learning. Part III: How is Changing Family Structure Affecting School Outcomes? N. Zill, Family Change and Student Achievement: What We Have Learned, What It Means for Schools. R.D. Mare, Changes in Families and Trends in Schooling. E.G. Menaghan, Family Composition, Family Interaction, and Children's Academic and Behavior Problems: Interpreting the Data. D. Scott-Jones, Toward a Balanced View of Family Change. Part IV: Building Research and Policy Agendas: New Directions. J.L. Epstein, Perspectives and Previews on Research and Policy for School, Family, and Community Partnerships. O.C. Moles, New National Directions in Research and Policy. G.M. Lloyd, Research and Practical Applications for School, Family, and Community Partnerships. D.T. Lichter, Family Diversity, Intellectual Inequality, and Academic Achievement Among American Children. K.L. Bierman, Family-School Links: An Overview.